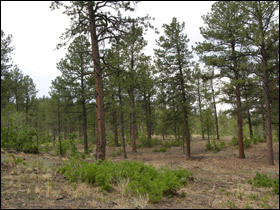 Managing forest biodiversity at an installation requires consideration of landscape elements of scale, disturbance, fragmentation, and habitat. At the local level, forest stand attributes such as structural diversity, crown closure, fuel loads, soils, standing dead trees, coarse woody debris, tree species diversity, and large wildlife trees, have a direct impact on biodiversity. When considering the various forest elements critical to biodiversity, it is also essential to consider the interaction of forests with other habitats, and the interdependence of habitats (e.g. unimproved grassland, wetlands, and hedgerows). Regardless of size, forests can provide habitats for a range of flora and fauna. Even small, recently established forests within otherwise intensively cultivated land can be useful, although the scope may be limited due to isolation and, in certain circumstances, they can harbor pest species. 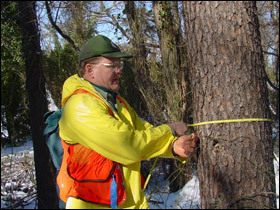 Forest management scales are generally defined by human-made or jurisdictional boundaries (e.g., landscape unit, watershed, forest stand) and on military installations by mission-related requirements. They do not necessarily apply to biological systems and managers may need to adapt them to accommodate more biologically sound scales. This may require coordination with local and regional neighbors. Disturbances due to forestry practices have different impacts on biodiversity than natural disturbances. Natural disturbances interact with the geology, climate and vegetation, and result in a complex mosaic of habitats at the landscape scale, while conventional logging, such as clearcutting, tends to homogenize the landscape. This can be compensated to some degree by creating snags, leaving standing and downed dead wood, and using other means to create a mosaic of habitats. Within the landscape context, fragmentation and habitat loss are two separate processes (Andrén 1994, With and King 1999). Two areas may have the same amount of habitat, but the spatial arrangement of remnant habitat and thus the amount of fragmentation within each, can be drastically different. Fragmentation of forest habitat into smaller isolated patches reduces the total amount of habitat area, increases edge effects around habitat patches, reducing the core area, and increases patch isolation. Current research findings suggest that overall habitat loss has a much larger effect on biodiversity than the spatial arrangement of remnant habitat (Fahrig 2001). Structural diversity is achieved when there is a variety of canopy layers (vertical structure) and spatial patchiness (horizontal structure). This creates more habitat and micro-climate diversity than in homogeneous stands. Structural diversity can be maintained or created through the choice of silvicultural system, harvesting methods, and stand-tending activities such as tree planting, pruning, fertilization, and pre-commercial and commercial thinning. Soil biodiversity can be achieved by forest soils management and forest practices that minimize soil disturbance and help maintain the below-ground biodiversity. Soil structure, nutrient spectrum, organic matter content, water retention, drainage, and pH combine to determine the vegetative composition of ecosystems. Standing dead trees provide nesting and foraging habitat for many species. Some existing snags in managed forests should be retained, but equally important is ensuring that new snags will be recruited into the stand in the future. Small diameter snags are adequate for some species, while large diameter snags are required by other species and endure longer. Coarse woody debris from decaying logs on the forest floor provides cover, micro- climates, and breeding habitat and should be retained in the stand. Larger size pieces are preferable as they provide the greatest longevity and potential for nutrient cycling and wildlife use in second-growth forests. Coarse woody debris is rarely evenly distributed, but it should be well distributed throughout the stand, if possible. Tree species diversity can provide habitat for a greater variety of organisms than that provided by a homogeneous stand. When applicable, an ecologically appropriate variety of tree species, including hardwoods, should be retained in a stand. Large wildlife trees are any standing live or dead trees with special characteristics that provide valuable habitat for conservation or enhancement of wildlife. Characteristics include large size; condition, age, and decay stage; evidence of use; valuable species types; and relative scarcity. These trees serve as critical habitat (for denning, shelter, roosting, foraging, and establishment) for vertebrates, insects, mosses, and lichens. Dorothy M. Gibb is the Technical Director at A.H. Environmental Consultants. Joseph S. Ferris is the Principal Environmental Consultant at Parsons Brinckerhoff. Click here to download Chapter 5 as a PDF.